Whether you are wearing a retainer during treatment or after your braces or Invisalign are completed at Greater Houston Orthodontics, over time… your retainers or aligners can discolor and look gross. You brush and floss daily, so adding cleaning your retainers to your daily routine is just another step to maintaining good oral hygiene habits. Dedicated Retainer Toothbrush – Since you will be cleaning off stuck on food and plaque from your retainer, you don’t want to share these bacteria on your teeth, gums, or tongue buy using the same toothbrush. Simple solution – Keep one of your old toothbrushes as a dedicated retainer toothbrush. Never Boil or Bleach to Disinfect – Boiling water is great for killing germs but will permanently warp a retainer. You should avoid hot water because even mild warping will prevent the retainer from seating properly and move teeth if not seated properly. Bleach can also warp and change the color of the plastic and is difficult to remove the odor and taste from the appliance. Protect Your Retainer With a Towel – Its easy to drop a retainer on the floor or into a sink. Adding a towel under your retainer will make it more difficult for it to slip off the counter; chip and break. Retainers are expensive to replace. Laying down a towel is added protection to avoid replacement costs. Keep Your Retainers Safe – A retainer can pick up a lot of germs when it’s sitting out in the open. You also run the risk of a pet chewing it up or throwing it out in the garbage by accident. 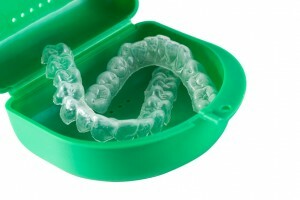 Keep your retainers safe in your retainer case when not in your mouth during lunch at school or during sporting events. Brushing alone is not enough over time to keep your retainers | aligners looking like new. Once and a while, they can use a little pick me up. Directions: In a warm bowl of water, use half water, half hydrogen peroxide, 2 TBSP of baking soda and a toothbrush. It will take many minutes to hours to brighten and clean depending upon the severity. Soak them overnight or all day if they are extra dirty. Soak your retainers | Aligners in a 50/50 solution of warm water and vinegar before brushing, up to 30 minutes to be on the safe side. It may take a few times to remove the saliva minerals that accumulate in the plastic to get them clean again. To remove the taste of vinegar, rinse well and soak a few minutes in mouth wash.
Hydrogen Peroxide works best to remove yellow stain and vinegar works best to remove crusty build up. Try both recipes, separately, if they are really looking gnarly. After spending time and money straightening your teeth, don’t slack off on the final step! Wearing your retainer as your orthodontist instructs will ensure you keep that beautiful smile for the rest of your life. Spending a little extra time will make your retainers last longer with a little extra effort to keep them clean and safe.